If you are one of internet users who love to download file (software, ebook, tutorial video or other kind of file) you need to be careful. Because every day there are thousands new virus which spreading and ready to infect your computer, one of the most popular way to spread it is from file download media. Because of that, we should choose trustable sites when referring a program, and if you’re looking for free program. It’s better when you use and download freeware or paid software which given free promotion (Free Giveaway) by the developer. Other thing that can be done if you not sure with the “sterility” of the file which you download is by scanning the file, there are lot of site services which provide “Online Scanner” which can be used freely. One of it is VirusTotal.com – Now VirusTotal have come with some more effective new features in analyzing a file to detect is it containing viruses, worms, Trojans, or all kinds of malware. 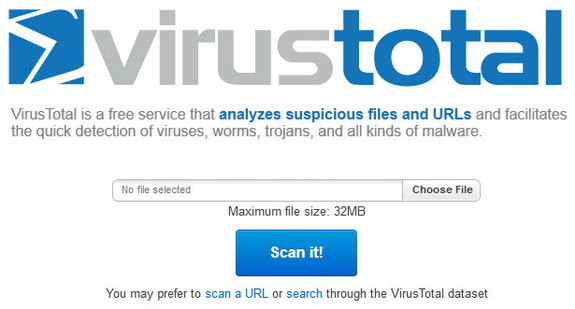 Before, VirusTotal can only scan a maximum 20MB size file, now you can scan up to 32MB file. Also now, scanning engine VirusTotal have been migrated to Google cloud service, which of course resulted a better performance compared to before. Scanning process will be faster and more accurate. In scanning, VirusTotal using scanning engine 41 popular antivirus (Kaspersky, TrendMicro, Symantec, Norman, F-Secure, Eset, Avira, AVG and lot of other anti virus software). And the result, report of Antivirus Total can be really accurate.